Picturesque America was a massive two volume set, first published in 1872. It is best known for the high quality illustrations of various natural features across the United States. In a way, it was the first popular coffee table book. In addition to the aforementioned natural wonders, the title also provides glimpses of life in cities across the country. Cleveland was included among these. A Cleveland Area History reader was kind enough to let me borrow a copy, so that I might make a high-resolution scan of the images - be sure to click through for more detail, if so desired. All are from the edition published by D. Appleton And Co., New York, 1872. 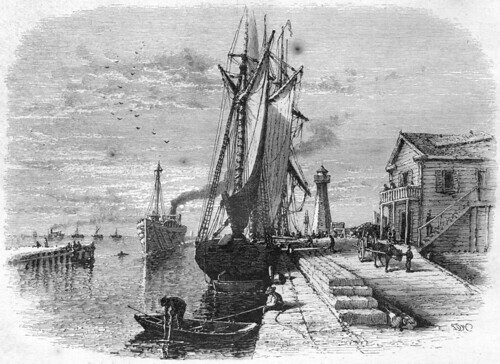 The chapter opens with, Mouth of Cuyahoga River, Cleveland (page 521) - shown above. Compare it to Otto Bacher's prints and drawings, which cover the same area, at about the same time. In the drawings, there is a certain quality of composition that is shared with this image. In Bacher's prints, it becomes darker, perhaps partially due to the nature of the etching process. This is followed (page 523) with Cleveland, from Scranton's Hill. The location today is close to West 17th Street, just north of Lorain Avenue - immediately before it crosses over the Cuyahoga River and becomes Carnegie. From this promentory, we can see a good part of the residential area of the city, as well as the industry that would transform it in the following years. If we look in the distance, in this historic view, we can see the steeples of several churches. 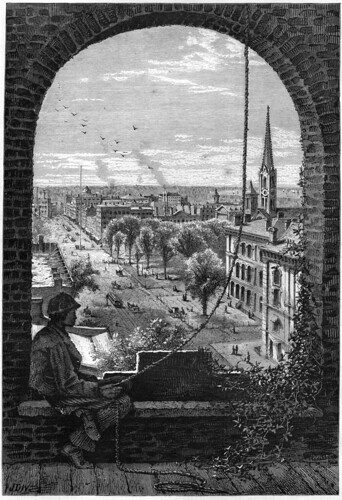 One of these provides a view of downtown Cleveland, looking west, in Superior Street, Cleveland, from Presbyterian Church (page 525). 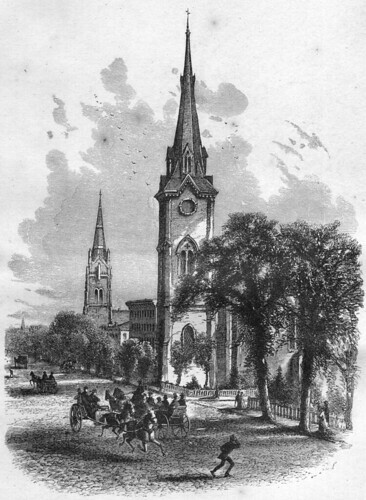 Second Presbyterian Church was located on the south side of Superior, just west of where the Arcade is located today. In the midground, there is a group of trees - Public Square. Adjacent to that is the one structure that remains from this historic view - the Old Stone Church. Immediately between the the viewer and the church is the old post office and custom house. A flagpole is visible near the center of Public Square. Behind this, on the right side of the street, is a building with a dome. This is the Weddell House, one of the city's best known early hotels. On the following page, we are provided with this view of Euclid Avenue, presumably looking east. I must confess that I cannot, with the resources I have in hand at the moment, identify the specific churches. Update: thanks to Kevin's comment below, I can now identify the scene. The view is indeed looking east, from about East 13th Street. The church in the foreground is the Euclid Avenue Presbyterian Church. It was located at what is now East 14th Street. In the distance, we can see the tower of the Euclid Avenue Baptist Church, at the corner of what is now East 18th Street. 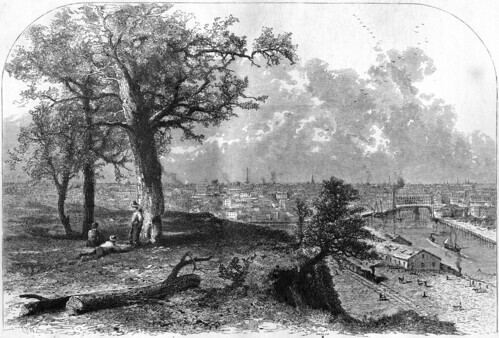 The Ohio City neighborhood is illustrated through this engraving, City of Cleveland, From Reservoir Walk, bound between pages 528 and 529. The reservoir was located on the block bounded by the streets now known as Franklin Boulevard on the north, West 32nd Street on the east, Woodbine Avenue on the south, and West 38th Street on the east - the block that now includes Fairview Park. The reservoir provided an excellent view of the city. About a third of the way from the right, the Methodist Church is visible. Just behind that is the steeple of the Baptist Church. Off center, in the distance, the First Congregational Church can be seen. In the distance, we can see Lake Erie, with several boats sailing on it. The two remaining views of the Cleveland area are both of the Rocky River. One, here, provides a view from close to the river itself. The other shows the lake from a bluff overlooking it. From here, the authors continue west, with two views of the Black River in Elyria. The commercial importance of Sandusky is illustrated through lumber boats there, not unlike the scene at the mouth of the Cuyahoga here in Cleveland. In addition, we are provided a view of the city iteself. The journey west continues to Kelly's Island, and then to Put-In-Bay, shown here. At Put-In-Bay, we are given a look into Perry's Cave and two features on Gibraltar Island, in the harbor at Put-In-Bay, - Perry's Lookout and the Sphinx Head. The journey along the south shore of Lake Erie concludes with this view of Toledo. In many ways, it seems to resemble Cleveland. These views provide an idealized view of Cleveland and the adjacent areas in the 1870s. Looking at them and then at Cleveland as seen by Otto Bacher would be an interesting exercise - Bacher's drawings and prints provide a somewhat different perspective. I'm always looking for unpublished or underutilized historic imagery of northeast Ohio. If you have books or photographs that you are willing to share, please contact me, that I might scan them and share them with a wider audience. Do you think that the church in the background of the Euclid Avenue picture might be the Baptist Church? Kevin, thank you for pointing that out. I can now identify both churches, and have updated the post accordingly. Thanks, Christopher, for putting up the Picturesque America prints of 1872, and for comparing them with Otto Bacher’s prints and drawings of 1877-78. These are two of numerous historical image collections that can help build a rich panorama of nineteenth century Cleveland. I’m thinking also of Thomas Whelpley’s landscape paintings (1833), Crisfield Johnson’s lithographs (1879), and the great number of archived drawings and photographs of individual buildings from the 1800s. To this point, we have been concerned with digitizing and posting such images individually in their original two-dimensional formats. This is good but we can do better. The technology exists to digitize and interleave the entire body of information on a three dimensional grid. The historical (built) dataset could then be integrated with high-resolution Digital Elevation Models of the natural terrain. The entire work could then be made real through holography or 3-D printing. The result would be stunningly accurate representations of the early urban landscape. With new technologies applied to forgotten historical resources, we have the means to make the past live and, I believe, provide models for rebuilding a more livable city. Let’s try to visualize one example. 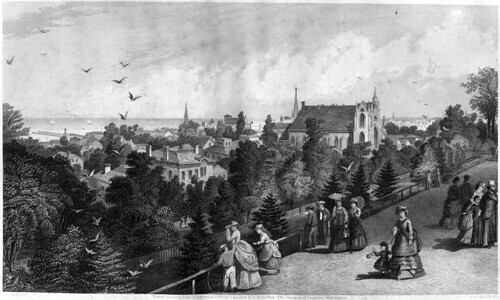 The early panoramas show that in the 1870s, Cleveland’s larger buildings, especially churches and commercial blocs (such as Stanley), were built of local stone. In its institutional architecture, Cleveland was a sandstone city with its own—unique—kinds of sandstone. By the 1890s, nevertheless, imported stone began to replace the local, and the city became less unique. Cleveland’s stone-built heritage is an asset with new potential. The 2011 Pritzker Prize winner is Portuguese architect, Eduardo Souto de Moura. He is recognized for adapting contemporary minimalist design to local building materials and masonry traditions. The Pritzker award encourages us to revalue our local stone legacy and even to revive it—and there is precedence. In 2008, Temple Emanu El, working with Studio Techne, used Berea sandstone as the primary decorative element for its Orange Village synagogue. The desire was to recall Jerusalem limestone in an economical way. As well as building upon a local resource, the result is quite handsome. We need more research into the old ways and new means to make use of what we find. Thank you for reminding me about Thomas Whelpley. I did a piece, with high resolution versions of his prints back in September. Thanks for this excellent post. I'm looking at my own copy of Picturesque America, and your post helped me to understand what I'm seeing.